I know, it's super easy. Easy, maybe. Fast? Not necessarily. I think that making blocks might have been just as fast as sewing these pieces of scraps to this adding machine paper. 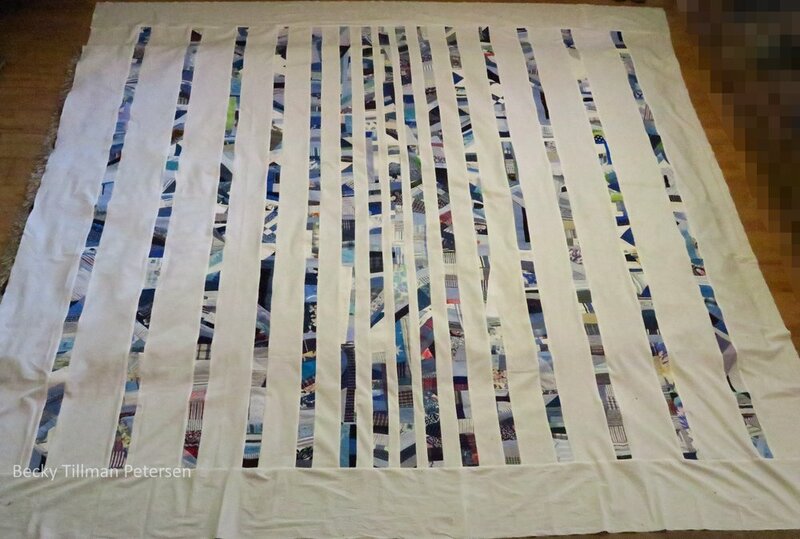 I needed 15 strips of 86.5" long - so that's over 36 yards (length of tape) of it - (1297.5") - and over 2595 square inches of fabric or over 2 square yards of fabric. I'm happy with that. This one doesn't use up as many as some because there is so much negative space in this project. Once I had the scraps sewn on to the tape, I stitched close to the edge of the paper and trimmed close. For the most part, THOSE trimmings got thrown away! Yes. I threw those tiny pieces in the trash. They will become kindling. I needed 2 of these round things Plus another 6 yards or so. The next thing I needed to do was to decide on the length of the blues. Do you remember that I wanted to make it similar to this one? But a bit bigger. A different Crumby Stripes that I made a few years ago. It's smaller than most of the ones I make these days. So instead of 80" as in the one shown above, I cut mine at 86.5" - and I used my table as the measuring constant. My table measures 96" long. I laid out the strips on the table and measured back 9.5" and cut them off. I did this with each of them. I decided to make the first whites cut at 1 3/4" - and then went up to 2.5", 3.5", 4.5", 5.5", 6.5" etc. My strips cut 86.5" long. By making the outer white strips wide, I got the effect of "losing color" as I went towards the outside of the top. I left the paper on as I sewed the white on to the strip- place the paper side down with the regular fabric on top. 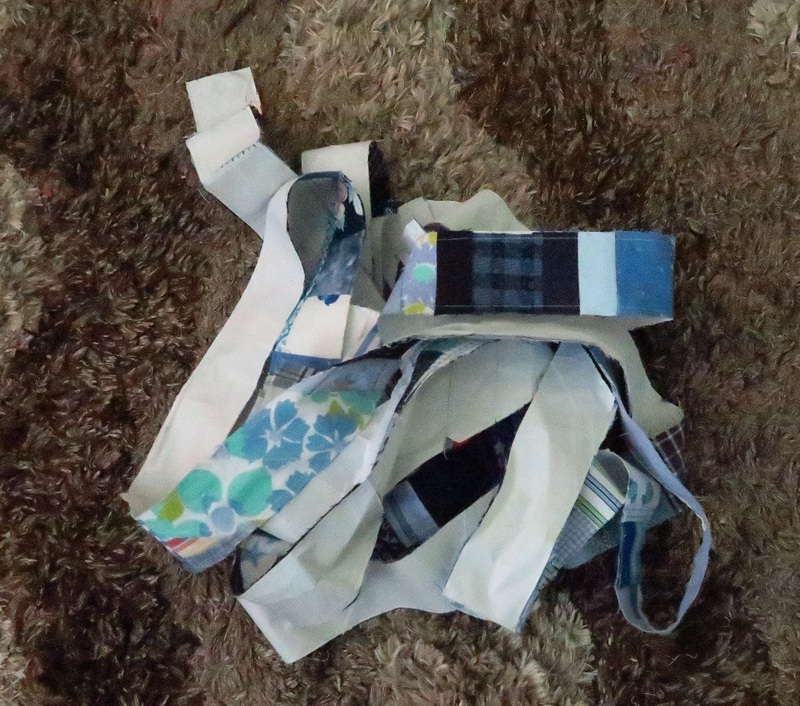 I made sure that each of the white cotton pieces "fit" the stripe of crumbs sewn to the adding machine tape so they all ended up the same length. I matched the centers of the strips. I'm going to leave the paper on as I quilt it as well. Yes I am. I did it last time and I do not feel little pieces of paper inside the quilt and it has been washed two times (All Crumbled Up). If that bothers you - even the idea of it, then plan on spending some serious time pulling paper off - maybe while you watch tv or go on a trip or something - before you sandwich this quilt. 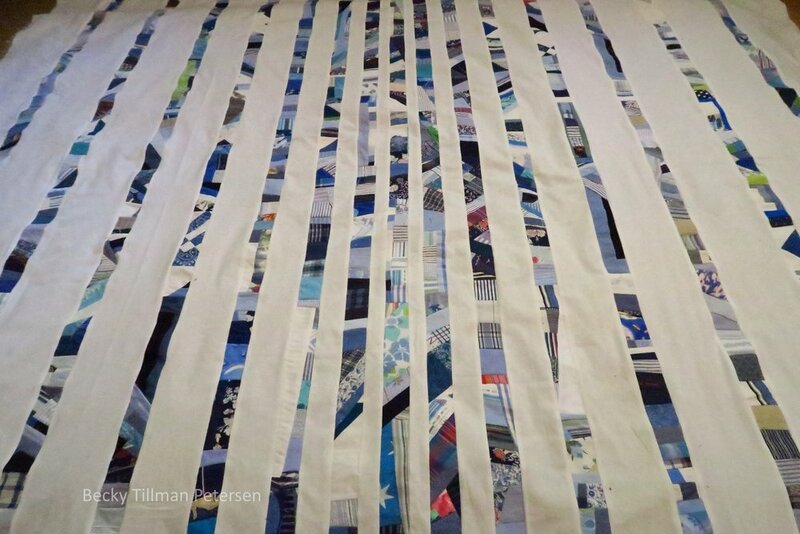 I would not pull the paper off before sewing it into the blocks or pieces as it will all stretch out - or at least mine would. The paper gives it stability as mine have all kinds of weird shaped or sized pieces. This was early on - after I had added 3 "stripes". After these, I made the white strips wider and wider - making both sides the same. I worked from the center "out". I want to quilt it with straight line quilting - diagonally across the quilt - close - not crazy close like 1/4", but maybe 1/2"? We'll see what I feel like when I sit down to do it. This will help make it look more modern. I'm actually eager to try this - but not when it's so hot outside. I'm still thinking about how I want to do it - all I know for sure is that I want to do some sort of diagonal quilting with my walking foot. I got excited about the idea of this quilt this past week so I spent quite a bit of time sewing scraps to the paper tape. That's the only reason I could do it so quickly - but once you have the scraps sewn on to the tape, the actual top is quite easy. This top will finish about 96" wide by about 104" or so. This will make it still be a nice queen size even if it shrinks 5%. And that's what I've been doing in my sewing room! I hope this finds you having a wonderful day - wherever you are! 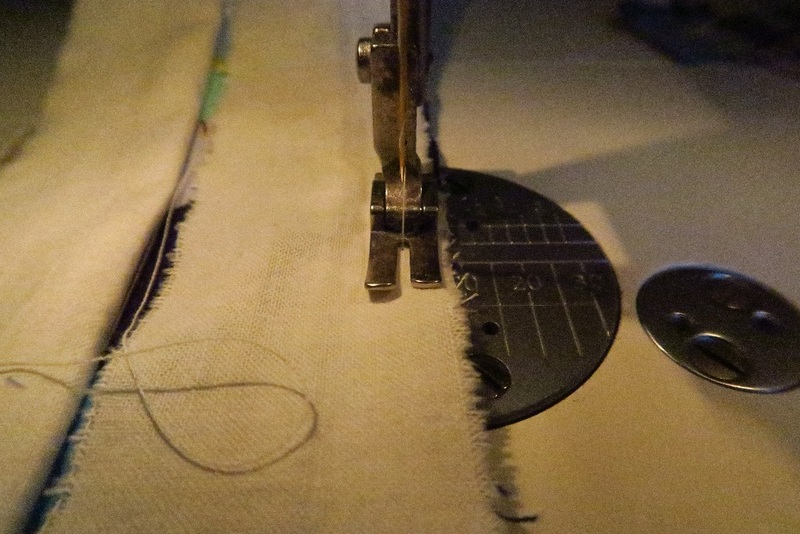 And I know...I need to make a tutorial on sewing scraps to adding machine tape - my problem isn't that I'm afraid - the problem is that I haven't figured out how to video it - for maximum efficiency. People that do videos have hours and hours of editing to get a video to be good - and I'm not sure I want to put in the time - but I've not forgotten! Here's a video that shows how one lady does it. I use basically the same method except she is way neater - and uses more regular sizes/shaped pieces than I do. I think it should give you an idea though if you truly don't have a clue about how to do it. I also stay stitch the edges because I put way more scraps on mine a less regular pattern than she does. I hope this helps! This should make a semi-modern looking quilt from these very random pieces! And that's what's been happening from my part of the world in relation to quilting.